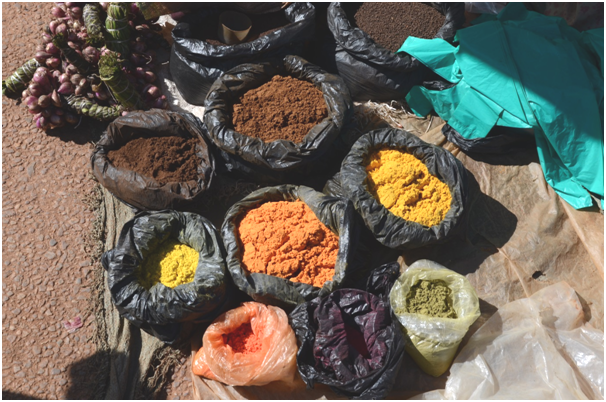 An African Street Market – Beats Whole Foods Any Day! This month’s end-of-the-month guest post is from Pash. Re-discovering Africa on her own terms as an adult… sounds great! Since I moved back to Uganda after seven years of living in the UK, I have wanted to explore Uganda and my neighbourhood in particular. I lived here earlier, from the age of 12 to 18; however, this time around the goal was to truly discover the Pearl of Africa, on my terms. 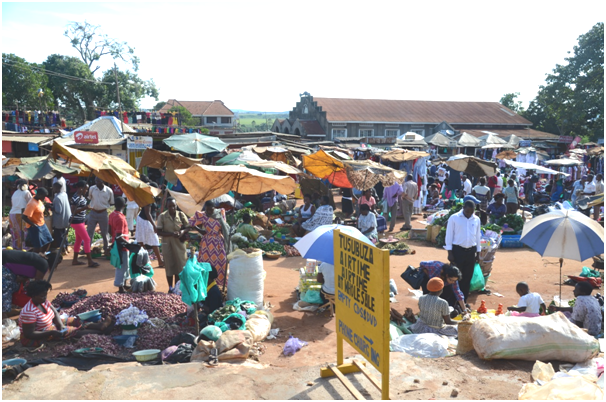 So, when I came to know that there is a bustling street market in my neighbourhood town of Kitoro in Entebbe, one Tuesday I sneaked out of work early, grabbed my camera and off I went. Food has always been my passion, and I am always on the lookout for new flavours and culinary inspiration. On a regular day of the week, Kitoro town operates like any other small town, but on Market Tuesday, it comes alive. Vendors just pitch up their stalls wherever they find a spot and start selling their goods. Before you enter the market, expect the regular prices to be marked up by at least 50%; so better bring along your bargaining skills. 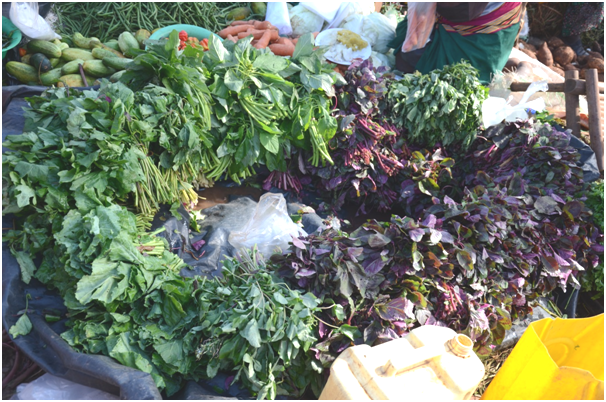 All the products they sell in this market are grown by independent small scale rural farmers, meaning they are 100% organic and pesticide free. Scotch Bonnet peppers are one of the hottest peppers in the world. 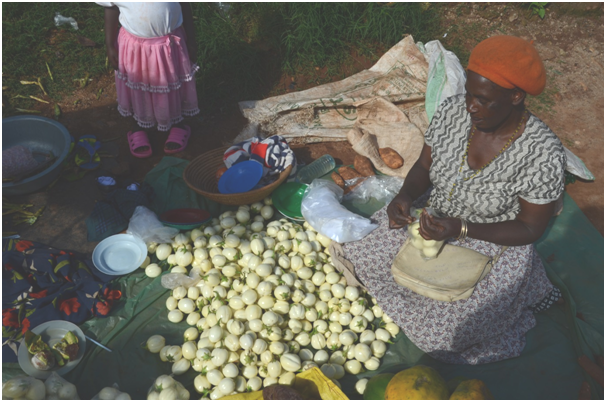 Uganda produces and exports a lot of Scotch Bonnet peppers. The powders here are the Scotch Bonnet peppers which have been dried and ground. The difference in the colours come from the various types of peppers used. 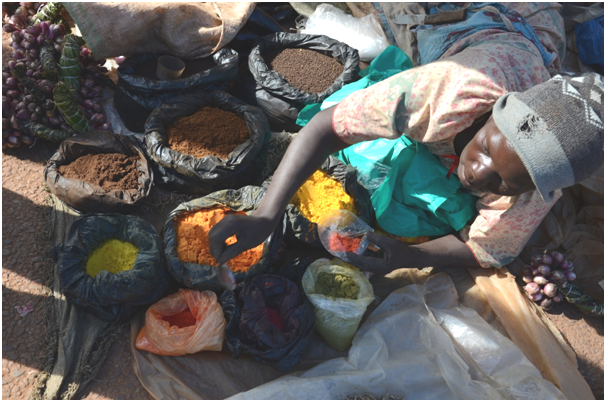 Most people tend to buy a blend of the different powders to suit their taste which this lovely lady mixes up in small sachets according to your preference. Spinach galore!!! The green spinach is used to make a classic simple Ugandan stew with sesame seeds. This leafy spinach is slightly different with a rougher texture and a slightly bitter aftertaste but delicious none the less. 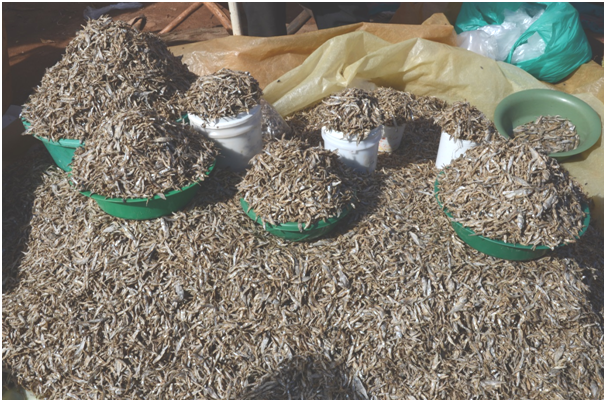 Mounds of dried small fish locally known as Mukene can be found throughout the market. It has a particularly strong scent which can be overpowering at times. Mukene or silver cyrprinid is a species of ray finned fish that can only be found in Lake Victoria, the second biggest lake in the world. Uganda shares the shores of Lake Victoria with Kenya and Tanzania. Kitoro being less than 10 minutes away from the lake is the best place to pick up some Mukene. Pure white aubergines which I have never seen before. Turned out to be extremely flavourful when cooked, possibly even better than the regular purple ones I normally buy. All that walking around started to get me quite peckish, so my attention quickly turned from the fresh produce to the ready to eat variety. 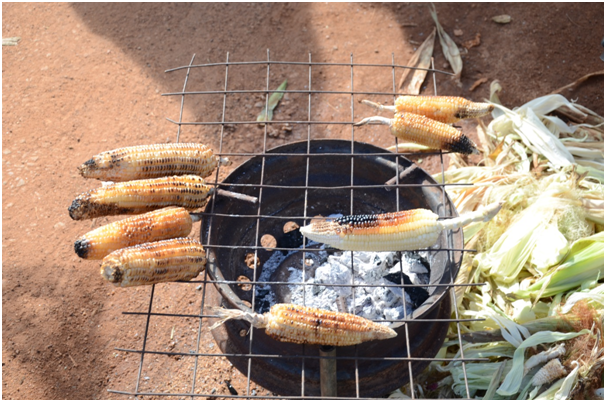 First stop, freshly grilled corn on the cob over a charcoal stove giving it a nice smoky flavour. 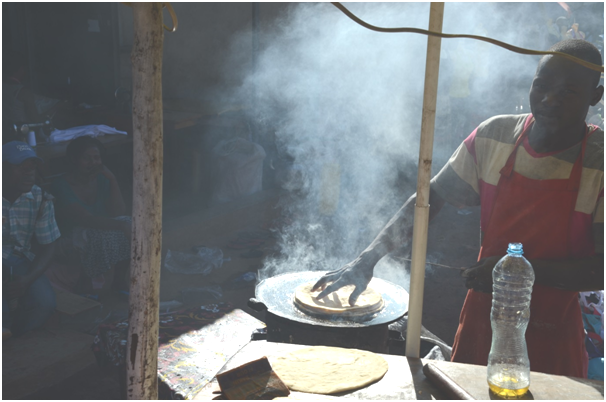 My all time favourite Ugandan street food – the ROLEX!! The phrase ‘simplicity is key’ comes to mind. 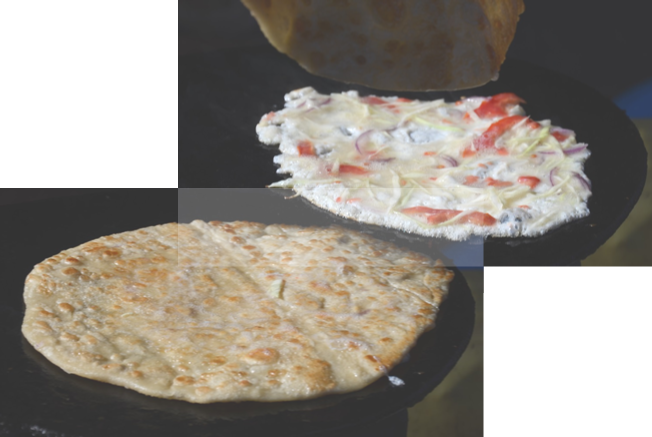 All this is a chapatti or tortilla coated in a mix of egg beaten with fresh cabbage, tomatoes and onions, and pan fried. PERFECTION! I always find myself craving one of these after a long day of work. Grilled plantains or Gonja as it is locally called, is a simple treat. 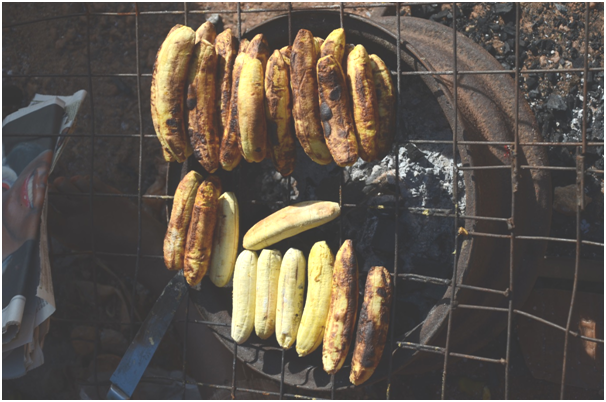 The trick to making a good gonja is of course, a charcoal stove and a banana that is slightly ripe so that it still holds its own over the intense heat. It is safe to say that I will be heading back out to the market again. Better brush up on my bargaining skills.